The “Three Bowl Method” is great for breading fish or chicken. You will want to use three different bowls for the flour, egg wash and coconut crust topping. First bowl - place the ½ cup of flour. Second bowl - mix the egg and water together until blended. Third bowl - add the coconut, 2 tablespoons of flour and Creole seasoning and mix together. 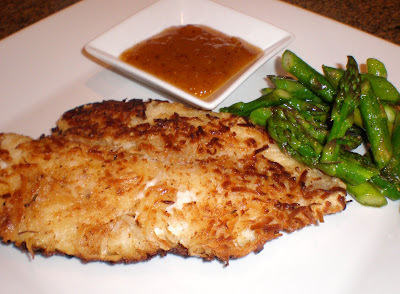 Take each Tilapia filet through the breading process and place on a plate until ready to cook. One filet at a time, you will want to cover with flour, dip in egg wash and press coconut topping on both sides of filet. Repeat process until all four are prepared. In a large skillet pan, place the oil in pan and heat on medium. Place each filet into the pan and cook for about 3 to 4 minutes per side. After removing from the pan, season with salt. Mix all ingredients together in a bowl and serve as a dipping sauce. Looking forward to making this tonight:) thanks!